Another handmade artisan organic pasta from the Puglia region, orecchiette pasta or “little ears” in English. From the award winning pasta makers of Marella Pasta, this delightful pasta is something you may want to have in your pantry. 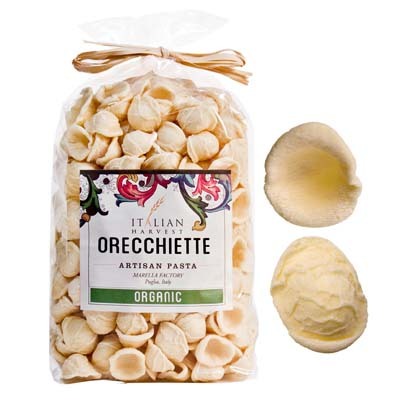 What is orecchiette exactly? It’s a delicious handmade pasta that look like a small ear. The shape is created by pressing your thumb into small dough balls. The hollow parts are perfect for catching all sorts of yummy pasta sauces. Doesn’t matter what kind, you can use tomato, cream, ragù, or any savory pasta sauce you can think of! Doubtful? Try them and find out! Want to know how you make this pasta shape? Watch the video The Orecchiette Ladies.